As part of our commitment to innovation, we offer specialty contact lenses (i.e. scleral lenses) for for patients with corneal diseases such as keratoconus, pellucid marginal degeneration, etc. with customized scleral lenses that allow them to see better than glasses. We are also a part of a network of doctors of Precision Keratoconus Treatment Center of California who offer scleral lens fits and other keratoconus treatment options. 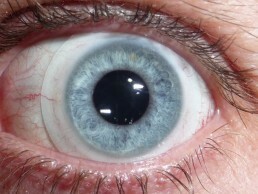 An overview of what is involved when you are interested in scleral lenses or have been recommended scleral lenses as a good option to improve your vision. A comprehensive eye exam is needed to evaluate the status of your case and determine if you are a good candidate for scleral lenses. If our optometrists find that you may be a good candidate for scleral lenses, we will then schedule an initial fitting appointment. Various diagnostic scleral lenses will be placed onto your eye to assess for proper fitting of the lenses and a new prescription will be derived from the initial lenses for ordering. This appointment may take about an hour. After your lenses are ordered in your proper parameters and prescription, you will have an appointment to place this set of lenses on to be evaluated for proper fit. This may take multiple visits as a series of lenses may be ordered prior to the final lens. A training will also take place on how to teach you how to insert, remove and clean the scleral lenses. After the best fit lens has been determined and patient scleral training has been completed successfully, you will be able to wear the lenses for a trial period and return for a final appointment for reassessment of the fit of the lenses prior to finalizing the scleral lens prescription. If all is well, you are ready to wear your scleral lenses daily and enjoy sharper, clearer vision!